This is an Open Source Hardware and Software Project for building tiny Embedded Ethernet Devices. You can find an initial Git repository in the download area. A new Nut/OS beta version 5.2.4 is available in the download area. A new Nut/OS beta version 5.2.2 is available in the download area. The latest Linux packages of Nut/OS were incomplete. Check for an update in the download area. The latest Nut/OS betas were not complete. Check for an update in the download area. A short guide explains how to build Nut/OS for the Ethernut 5 board. A new beta version 5.2.1 of Nut/OS is available in the download area. Ethernut 5 Linux support is moving from Ångström distribution to the Yocto Project. Added a first few notes and links about Transport Layer Security. The new major stable release 5.1 of Nut/OS is available in the download area. A new beta version 5.0.5 of Nut/OS is available in the download area. 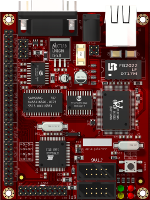 Two new pages describe SPI and memory card support for the Elektor Internet Radio board. A new tutorial explains how to configure OpenOCD for the AT91SAM7SE. The MicroHTTP library is explained on several new pages. A new bugfix release 4.10.3 (stable) and a new beta 5.0.4 of Nut/OS are available in the download area. The document that explains how to build an Ethernut 5 board support package has been updated with Linux kernel 3.2.9. 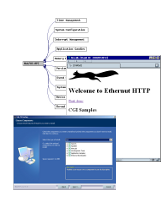 A first release of the Linux kernel 3.2.9 for Ethernut 5 is available in the download area. Linux support for Ethernut 5 has been updated. Some new pages explain ARM Cross Development with Eclipse in a more general way. Documentation of the Turtelizer had been updated. Two new document explain source code debugging on Ethernut 5 and the Elektor Internet Radio. A new document describes Ethernut 3 Source Code Debugging with Eclipse and OpenOCD. The new stable release 4.10 of Nut/OS is available in the download area. A new document has been started, which should help to port Nut/OS to new platforms. See its current status. A first release candidate of the upcoming Nut/OS version 4.10 is available in the download area. The documentation about the Ethernut 5 boot loader had been extended by a new page titled Ethernut 5 U-Boot Environment. Furthermore, the download area offers a new Linux kernel release. Another new page shows how to build an Ångström Distribution for Ethernut 5. A new page explains how to boot Ethernut 5. Added NutDAC to the appliances page. It is a great software system, which helps to create generic embedded real time data acquisition and control applications that can be remotely controlled from a PC. The boot loader for Ethernut 3 had been updated. The archive bootmon-1.2.1.zip is available in our archive. The page Ethernut 3 JTAG will explain the update procedure. The Nut/OS Programming Style Guide has been updated. The document about Setting up PPP has been updated. A bugfix release of Nut/OS 4.8 is available in the download area. The list of compatible boards had been updated. A bugfix release of Nut/OS 4.8 and a new beta release 4.9 are available in the download area. On this year's ElektorLive! event, which takes place on Nov. 20th, 2010, we will present the Fischertechnik Factory.